The American Journal of Orthopsychiatry (AJO) is dedicated to informing public policy and professional practice and to the expansion of knowledge relating to mental health and human development from a multidisciplinary and interprofessional perspective. 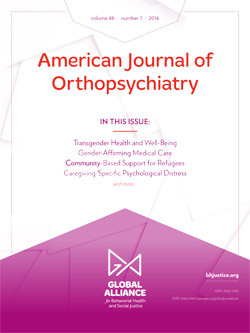 As the principal publication of the Global Alliance for Behavioral Health and Social Justice, the American Journal of Orthopsychiatry (AJO) reflects the Alliance’s goal of informing policy, practice, and research concerning behavioral health, social justice, and well-being. Consistent with that mission, the journal publishes articles that clarify, challenge, or reshape the prevailing understanding of factors in the prevention and correction of injustice and in the sustainable development of a humane and just society. What's in the current issue of AJO? Kim, D. H., Bassett, S. M., So, S., & Voisin, D. R. (2019). Family stress and youth mental health problems: Self-efficacy and future orientation mediation. American Journal of Orthopsychiatry, 89(2), 125-133. Sulimani-Aidan, Y., Melkman, E., & Hellman, C. M. (2019). Nurturing the hope of youth in care: The contribution of mentoring. American Journal of Orthopsychiatry, 89(2), 134-143. Wolford, S. N., Cooper, A. N., & McWey, L. M. (2019). Maternal depression, maltreatment history, and child outcomes: The role of harsh parenting. American Journal of Orthopsychiatry, 89(2), 181-191. Presseau, C., DeBlaere, C., & Luu, L. P. (2019). Discrimination and mental health in adult transracial adoptees: Can parents foster preparedness? American Journal of Orthopsychiatry, 89(2), 192-200. Li, X., Lam, C. B., Chung, K. K. H., & Leung, C. (2019). Linking parents’ self-stigma to the adjustment of children with disabilities. American Journal of Orthopsychiatry, 89(2), 212-221. Kritikos, T. K., DeVoe, E. R., & Emmert-Aronson, B. (2019). The effect of a parenting intervention on relationship quality of recently deployed military service members and their partners. American Journal of Orthopsychiatry, 89(2), 170-180. Fridman-Teutsch, A., & Attar-Schwartz, S. (2019). Commitment to school and learning among youth in residential care: The role of mother and father support and parents’ divorce. American Journal of Orthopsychiatry, 89(2), 201-211. Acarturk, Z. C., Abuhamdeh, S., Jalal, B., Unaldı, N., Alyanak, B., Cetinkaya, M., . . . Hinton, D. (2019). Culturally adapted transdiagnostic CBT for SSRI resistant Turkish adolescents: A pilot study. American Journal of Orthopsychiatry, 89(2), 222-227. Manove, E. E., Lowe, S. R., Bonumwezi, J., Preston, J., Waters, M. C., & Rhodes, J. E. (2019). Posttraumatic growth in low-income Black mothers who survived Hurricane Katrina. American Journal of Orthopsychiatry, 89(2), 144-158. Jayawickreme, E., Jayawickreme, N., Zachry, C. E., & Goonasekera, M. A. (2019). The importance of positive need fulfillment: Evidence from a sample of war-affected Sri Lankans. American Journal of Orthopsychiatry, 89(2), 159-169. Damian, A. J., Mendelson, T., Bowie, J., & Gallo, J. J. (2019). A mixed methods exploratory assessment of the usefulness of Baltimore City Health Department’s trauma-informed care training intervention. American Journal of Orthopsychiatry, 89(2), 228-236. Gómez, J. M. (2019). What’s the harm? Internalized prejudice and cultural betrayal trauma in ethnic minorities. American Journal of Orthopsychiatry, 89(2), 237-247. Kidd, S. A., Vitopoulos, N., Frederick, T., Leon, S., Karabanow, J., & McKenzie, K. (2019). More than four walls and a roof needed: A complex tertiary prevention approach for recently homeless youth. American Journal of Orthopsychiatry, 89(2), 248-257. SmithBattle, L. (2019). Housing trajectories of teen mothers and their families over 28 years. American Journal of Orthopsychiatry, 89(2), 258-267. Williams, A., Giano, Z., & Merten, M. (2019). Running away during adolescence and future homelessness: The amplifying role of mental health. American Journal of Orthopsychiatry, 89(2), 268-278. Brown, M., Mihelicova, M., Collins, K., & Ponce, A. (2019). Predictors of employment outcomes in a comprehensive service program for individuals experiencing chronic homelessness. American Journal of Orthopsychiatry, 89(2), 279-286. Gabrielian, S., Bromley, E., Hamilton, A. B., Vu, V. T., Alexandrino, A., Jr., Koosis, E., & Young, A. S. (2019). Problem solving skills and deficits among homeless veterans with serious mental illness. American Journal of Orthopsychiatry, 89(2), 287-295. Vázquez, J. J., Berríos, A. E., Bonilla, E., & Suarez, A. C. (2019). Homeless people in León (Nicaragua): Conceptualizing and measuring homelessness in a developing country. American Journal of Orthopsychiatry, 89(2), 296-303. Vázquez, J. J., & Panadero, S. (2019). Suicidal attempts and stressful life events among women in a homeless situation in Madrid (Spain). American Journal of Orthopsychiatry, 89(2), 304-311. AJO publishes theoretical, policy-analytic, and empirical articles on topics related to the Association’s historic values and themes. Scholars interested in the topical domains that are within AJO’s scope are encouraged to submit individual manuscripts for consideration. Contemporary topics in AJO’s topical scope include, but are not limited to, public behavioral health and prevention; institutional reform; causes and solutions to behavioral healthcare disparities; adaption of behavioral health methods to the needs of racial, ethnic, cultural and other minority groups; responses to natural and human-made disasters; immigrants and refugees; underserved behavioral health populations; protection of vulnerable people; and sociocultural dimensions of behavioral health problems. Submissions are evaluated with respect to the importance and timeliness of the topic, scholarly and methodological rigor, interdisciplinary perspective, and clarity of implications for research, behavioral health practice and administration, and social policy. AJO occasionally invites leading scholars to edit special sections or issues on topics of particular interest. These issues usually contain articles solicited by the guest editor, who coordinates initial reviews of the manuscripts that are submitted in response to these invitations. If you have an idea for a Special Section or issue, contact Jill McLeigh, Symposia Editor. AJO includes a unique magazine-in-a-journal. This feature is called Social Innovations and is intended to promote conversation about strategies for establishing new social settings and changing social norms to create more auspicious circumstances for mental health promotion. Scholars are welcome to submit articles for Social Innovations. Interested in subscribing to AJO? Join the Global Alliance and receive the journal free as a membership benefit! Access pricing information for individual or institutional subscriptions. Subscribe to the RSS feed for AJO. 1. Go to psycnet.apa.org and log in. 2. Click on "My PsycNET" on the far right of the blue bar at the top of the page. 3. Click the second tab, "PsycALERTS." 4. Click "Add Journal Alert." 5. Find AJO, check mark the box to the right of the journal, then scroll to the bottom of the page and click on "Subscribe." Member of the Global Alliance? Members of the Global Alliance have free electronic access to the journal! Access to the journal is through myAPA at http://my.apa.org. Your email address will be your username. The first time logging in you will need to create a password, using the “Forgot your password or email/username?” link. This will take you to the next page in which you will enter your e-mail address in the field under “I don’t know my password.” The system will email you a link to create your password. If you have a Google account, you may also login using Google. Once you successfully log in to your myAPA account, you go to area designated as “Subscriptions.” Under subscriptions, you will see the journal title/link. Once you click on the link, you will have access to all the issues and articles for that specific journal. If you need additional assistance, you can email [email protected], and they will help you out. Interested in submitting a manuscript to AJO? The American Journal of Orthopsychiatry is published by the American Psychological Association (effective with the 2014 volume). For more information about the scope of the journal, criteria and procedures for selection of manuscripts for publication, manuscript submission instructions and editorial policies, please review the Instructions to Authors. We invite authors to visit the American Journal of Orthopsychiatry manuscript submission site to learn about current editorial policies for AJO and to submit manuscripts for publication. If you have questions about a manuscript that has been submitted or that you are interested in submitting, please contact Dr. Jill McLeigh.